The discovery of Proxima b is the biggest exoplanet discovery since the discovery of exoplanets. The planet is not much bigger than Earth and resides in the “habitable zone” of the Sun’s nearest stellar neighbor. This planet may represent humanity’s best chance to search for life among the stars. But is Proxima b habitable? Is it inhabited? These questions are impossible to answer at this time because we know so little about the planet. However, we can extrapolate from the worlds of our Solar System, as well as employ theoretical models of galactic, stellar, and planetary evolution, to piece together realistic scenarios for Proxima b’s history. The possibilities are varied and depend on phenomena usually studied by scientists in fields that are considered distinct, but an integrated perspective — an astrobiological perspective — can provide a realistic assessment of the possibility that life could have arisen and survived on the closest exoplanet. As an astrobiologist and astronomer at the University of Washington, and a member of NASA’s Virtual Planetary Lab, I have investigated the habitability of planets orbiting red dwarfs for years. My research involves building computer models that simulate how planetary interiors and atmospheres evolve, how stars change with time, and how planetary orbits vary. The discovery of Proxima b has me very excited, but being Earth-sized and in the habitable zone are just the first two requirements for a planet to support life, and the list of requirements is much longer for planets orbiting red dwarfs than for stars like our Sun. If Proxima b is in fact habitable, meaning it possesses liquid water or even inhabited, meaning life is currently present, then it will have traversed a very different evolutionary path than Earth. This difference is frustrating, in that it will make our initial interpretations challenging, but also exciting, as it offers the chance to learn how Earth-sized planets evolve in our universe. Whether Proxima b is a sterile wasteland or teeming with life, we are now embarking on an unprecedented era of discovery, one that may finally provide an answer that age-old question “Are we alone?”. To evaluate the possibility of life on Proxima b, we must begin with the only habitable planet we know, Earth. Life on Earth has established itself in a stunning diversity of habitats, including acidic hot springs, the deepest reaches of the oceans, microscopic channels in sea ice, and the deepest levels of Earth’s crust. Regardless of how extreme the environment, all life on Earth requires three basic ingredients: energy, nutrients and liquid water. The first two ingredients are very abundant throughout the universe, as is the water molecule. The limiting factor from an astrophysical perspective is that water must be in its liquid phase. The habitable zone is a map of where liquid water could exist on the surfaces of rocky, Earth-like planets, hence its status as the first requirement for a planet to be habitable. Life also requires sufficient time to originate and evolve, but on Earth it has proven resilient to calamities as trivial as a thunderstorm or as traumatic. The variety and tenacity of Earth-bound life encourages astrobiologists to imagine that life can exist not only on Earth-like exoplanets, but also on strange, exotic worlds. So what to make of Proxima b? It is at least as massive as Earth, and may be several times more massive. Its “year” is just over 11 days and its orbit may be circular or significantly elongated. Its host star is only 12% as massive as our Sun, 0.1% as bright, and it is known to flare. It may be joined to the stars Alpha Centauri A and B, 15,000 astronomical units (AU) away, by their mutual gravitational attraction. All three stars contain substantially more heavy elements than our Sun, but we know very little of the composition of Proxima b, or how it formed. The new data point toward the presence of a second planet orbiting in the system with a period near 200 days, but its existence cannot be proven at this time. These are the facts we have and from them we must deduce whether Proxima b supports life. Proxima b was detected via the radial velocity method, which does not provide a direct measurement of the planet’s mass, only a minimum mass. So, the first question we’d like to answer is whether the planet’s mass is low enough to be rocky like Earth. If the planet is much larger, it may be more like Neptune with a thick gaseous envelope. While we don’t know where the dividing line between rocky and gaseous exoplanets is, models of planet formation and analyses of Kepler planets suggest the transition is between 5 and 10 times the mass of Earth. Only about 5% of allowed orbits place Proxima b’s mass above 5 Earth masses, so it is very likely that this planet is in the rocky range. The next question to ask is if the planet actually formed with water. Water consists of hydrogen and oxygen, the first and third most common elements in the galaxy, so we should expect it to be everywhere. Close to stars, however, where Proxima b resides, water is heated into its vapor phase while planets are forming, and hence it is difficult for planets to capture it. Planets that form at larger distances can gather more water, so if Proxima b formed farther out and moved to its current orbit later, it is more likely to be water-rich. At this time, we don’t know how the planet formed, but three scenarios seem most probable: 1) the planet formed where it is from mostly local material; 2) the planet formed farther out while the gas and dust disk that birthed the planetary system still existed, and forces from that disk drove the planet in to its present orbit; or 3) the planet formed elsewhere and some sort of system-wide instability rearranged the planets and b ultimately arrived in its current orbit. The first method is how Earth and Venus formed, and so Proxima b may or may not possess significant water if it formed in this way. The second method produces planets that are very water-rich because water is more likely to be in its ice phase farther out in the disk and so the forming planet could easily gather it up. The third method is inconclusive as the planet could have come from an interior orbit and formed without water or farther out and be water-rich. We conclude that it is entirely possible that this planet has water, but we cannot be certain. Next let us consider the clues from the stars themselves. Computer models of the evolution of our galaxy suggest that stars enriched in heavy elements like Proxima cannot form locally (25,000 light-years from the galactic center) as there just aren’t enough heavy elements available. But closer to the galactic center, where star formation has been more vigorous and transpiring for longer, stars like Proxima are possible. Recent work by Dr. Sarah Loebman and colleagues has found that stars in our local solar neighborhood with compositions like Proxima must have formed at least 10,000 light-years closer to the galactic center. It would seem Proxima Centauri has wandered through our galaxy and this history may have played an important role in the evolution of Proxima b. Computer models of the evolution of the Milky Way galaxy suggest Proxima Centauri has moved outward at least 10,000 light-years from where it formed, shown by the orange circle. The Sun and Earth probably formed near where they orbit today (blue circle), which is where we find Proxima Centauri, too. The orbit of Proxima around Alpha Centauri A and B, assuming they are gravitationally connected, is large compared to other multiple star systems. In fact, it is so large that A and B’s hold on Proxima is weak and the effects of the Milky Way galaxy have shaped Proxima’s orbit significantly. The mass of the Milky Way as a whole causes Proxima’s orbit to vary both in shape and orientation continuously. Proxima is also susceptible to gravitational encounters from passing stars that can change its orbit. Recent simulations by Prof. Nate Kaib have found that these two effects can often lead to close passages between the stars in a multiple star system that disrupt their planetary systems. The disruption is often powerful enough to eject planets from the system and completely rearrange the orbits of the planets that remain. New simulations by Russell Deitrick are revealing that this scenario is a real concern for Proxima, too; there is a significant probability that at some point in the past, Proxima swooped in close enough to Alpha Centauri A and B to cause its planetary system to break apart, hurling Proxima b’s siblings into deep space. If such a disruption occurred, Proxima b may not have formed where we find it today because its orbit would have been affected by this disruption. Even if Proxima is not currently bound to Alpha Cen A and B, it appears to be travelling with them, and it is very likely the stars formed from the same cloud of dust and gas. If they formed together, they should have similar compositions and nearly identical ages. Connecting their ages is important because it is very difficult to measure the ages of low mass stars like Proxima Centauri. Astronomers can estimate the age of Alpha Cen A via asteroseismology, the study of “starquakes.” Stars bigger than the Sun vibrate with large enough amplitudes that brightness fluctuations can be observed, and careful monitoring of the pulsations can reveal a star’s age. Recent work by Dr. Michaël Bazot has found that Alpha Cen A is between 3.5 and 6 billion years old. This range is larger than we would like, but Proxima is certainly old enough to support life, and Proxima b might even be about the same age as Earth! Next we turn to clues from the Proxima Centauri planetary system. The vast majority of the energy used by life on Earth comes from our Sun, and small stars like Proxima can produce energy for trillions of years. The host star is almost as small as stars come, so for a planet to receive as much stellar energy as Earth, Proxima b must be about 25 times closer in than Earth is from the sun. This distance is where the habitable zone lies. While Proxima is much dimmer than the Sun, it is still a thermonuclear explosion, and, everything else equal, life seems more likely at larger distances. And indeed the close-in orbit does produce numerous obstacles that life on Earth did not have to overcome. These include a long formation time for the star, short and energetic bursts of energy in UV and X-ray light, strong magnetic fields, larger starspots, larger coronal mass ejections, and gravitational tidal effects that cause rotational properties to change and frictional heating in oceans (if they exist) and the rocky interior. The history of Proxima’s brightness evolution has been slow and complicated. Stellar evolution models all predict that for the first one billion years Proxima slowly dimmed to its current brightness, which implies that for about the first quarter of a billion years, Proxima b’s surface would have been too hot for Earth-like conditions. As Rodrigo Luger and I recently showed, had our modern Earth been placed in such a situation, it would have become a Venus-like world, in a runaway greenhouse state that can destroy all of the planet’s primordial water. This desiccation can occur because the molecular bonds between hydrogen and oxygen in water can be destroyed in the upper atmosphere by radiation from the star, and hydrogen, being the lightest of the elements, can escape the planet’s gravity. Without hydrogen, there can be no water, and the planet is not habitable. Escaping or avoiding this early runaway greenhouse is the biggest hurdle for Proxima b’s chances for supporting life. Figure 2: Proxima Centauri’s habitable zone has moved inward since it formed, which may mean that Proxima b lost its water shortly after it formed, when the system was 1—10 million years old. The habitable zone, shown in blue, doesn’t arrive at the orbit of Proxima b until almost 200 million years after it formed. This early brightness may be the biggest obstacle for life to have gained a foothold on Proxima b. As the star dims, the water destruction process halts, and so total desiccation is not inevitable. If some water remains, the atmosphere may also contain large quantities of oxygen leftover from the water vapor destruction. While having large amounts of water and oxygen may sound like a good recipe for life, it almost certainly is not. Oxygen is one of the most reactive elements, and its presence in the young atmosphere of Proxima b would likely prevent the development of pre-biotic molecules that require conditions with little oxygen to form. Life on Earth formed when no oxygen was present, and photosynthesis ultimately produced enough oxygen for it to become a major component of our atmosphere. Note that the destruction of only some water leads to the rather surprising possibility that the planet could possess oceans and an oxygen-rich atmosphere, but has been unable to support life! Another intriguing possibility is that Proxima b started out more like Neptune and the early brightness and flaring eroded away a hydrogen-rich atmosphere to reveal a habitable Proxima below. Such a world was investigated by Rodrigo Luger, myself and others, and was found to be a viable pathway to avoid total desiccation. Essentially the hydrogen atmosphere protects the water. If Proxima b formed with about 0.1-1% of its mass in a hydrogen envelope, the planet would lose the hydrogen but not its water, potentially emerging as a habitable world after the star reached its current brightness. 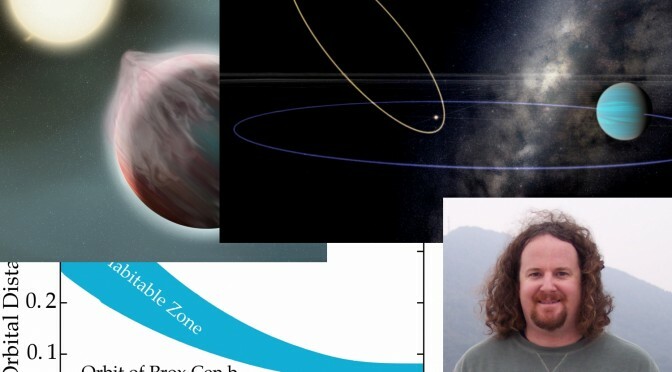 This wide range of possible evolutionary pathways presents a daunting challenge as we imagine using space- and ground-based telescopes to search for life in the atmosphere of Proxima b. Fortunately my colleagues in the Virtual Planetary Lab, Prof. Victoria Meadows, Giada Arney and Edward Schwieterman, have been developing techniques to distinguish the possible states of Proxima b’s atmosphere, whether habitable or not. Nearly all the components of an atmosphere imprint their presence in a spectrum, so with our knowledge of the possible histories of this planet, we can begin to develop instruments and plan observations that pinpoint the critical differences. For example, at high enough pressures, oxygen molecules can momentarily bind to each other and produce an observable feature in a spectrum. Crucially, the pressures required to be detectable are large enough to discriminate between a planet with too much oxygen, and one with just the right amount for life. As we learn more about the planet and the system, we can build a library of possible spectra from which to quantitatively determine how likely it is that life exists on Proxima b. While the early brightness of the host star is the biggest impediment to life, other issues are also important. One of the original concerns for the habitability of planets orbiting red dwarfs was that they would become “tidally locked”, meaning that one hemisphere permanently faces the host star. This state is similar to the rotation of our Moon, in which the same tidal forces that raise waves in our ocean have caused the Moon to show only one face to Earth. Because it is so close to its star, Proxima b may be in this state, depending on the shape of its orbit. For decades, astronomers were concerned that such a tidally locked planet would be uninhabitable because they believed the atmosphere would freeze and collapse to the surface on the permanently dark side. That possibility is now viewed as very unlikely because winds in the atmosphere will transport energy around the planet and maintain sufficient warmth on the backside to prevent this freeze out. Thus, as far as atmospheric stability is concerned, tidal locking is not a concern for this planet’s potential habitability. Although tidal locking is not very dangerous for life, it is possible for tides to provide large amounts of energy to the planet’s atmosphere and interior. This energy is often called “tidal heating” and is a result of the deformation of the planet due to changes in the host star’s gravitational force across the planet’s diameter. For example, if the planet is on an elliptical orbit, when it is closer to the star, it feels stronger gravity than when it is farther away. This variation will cause the shape of the planet to change, and this deformation can cause friction between layers in the planet’s interior, producing heat. In extreme cases, tidal heating could trigger the onset of a runaway greenhouse like the one that desiccated Venus, independent of starlight. Proxima b is not likely to be in that state, but the tidal heating could still be very strong, causing continual volcanic eruptions as on Jupiter’s moon Io, and/or raising enormous ocean waves. Based on the information we have now, we don’t know the magnitude of tidal heating, but we must be aware of it and explore its implications. The host star’s short, high energy bursts, called flares, are also a well known concern for surface life on planets of red dwarfs. Flares are eruptions from small regions of the surfaces of stars that cause brief (hours to days) increases in brightness. Crucially, flares emit blasts of positively-charged protons, which have been shown by Prof. Antigona Segura and colleagues to deplete ozone layers that can protect life from harmful high-energy UV light. Proxima flares far more often than our Sun and Proxima b is much closer to Proxima than Earth is to the Sun, so Proxima b is likely to have been subjected to repeated bombardments. If the atmosphere could develop a robust shield to these eruptions, such as a strong magnetic field that then flaring could be unimportant. Alternatively if it exists under just a few meters of water. Therefore, flares should not be considered fatal for life on Proxima b. The concern over flaring naturally leads to the question of whether the planet actually does have a protective magnetic field like Earth’s. For years, many scientists were concerned that such magnetic fields would be unlikely on planets like Proxima b because tidal locking would prevent their formation. The thinking went that magnetic fields are generated by electric currents moving in the planetary core, and the movement of charged particles needed to create these currents was caused by planetary rotation. A slowly rotating world might not transport the charged particles in the core rapidly enough to generate a strong enough magnetic field to repel the flares, and hence planets in the habitable zones of M dwarfs have no atmospheres. However, more recent research has shown that planetary magnetic fields are actually supported by convection, a process by which hot material at the center of the core rises, cools, and then returns. Rotation helps, but Dr. Peter Driscoll and I recently calculated that convection is more than sufficient to maintain a strong magnetic field for billions of years on a tidally locked and tidally heated planet. Thus, it is entirely possible that Proxima b has a strong magnetic field and can deflect flares. So is Proxima b habitable? The short answer is “It’s complicated.” Our observations are few, and what we do know allow for a dizzying array of possibilities. Did Proxima b move halfway across the galaxy? Did it endure a planetary-system-wide instability that launched its sibling planets into deep space and changed its orbit? How did it cope with the early high luminosity of its host star? What is it made of? Did it start out as a Neptune-like planet and then become Earth-like? Has it been relentlessly bombarded with flares and coronal mass ejections? Is it tidally heated into an Io-like (or worse) state? These questions are central to unlocking Proxima’s potential habitability and determining if our nearest galactic neighbor is an inhospitable wasteland, an inhabited planet, or a future home for humanity. The last point is not as rhetorical as it might seem. Since all life requires an energy source, it stands to reason that, in the long term — by which I mean the loooong term — planets like Proxima b might be the ideal homes for life. Our Sun will burn out in a mere 4 billion years, but Proxima Centauri will burn for 4 trillion more. Moreover, if a “planet c” exists and slightly perturbs b’s orbit, tidal heating could supply modest energy to b’s interior indefinitely, providing the power to maintain a stable atmosphere. If humanity is to survive beyond the lifetime of our Sun, we must leave our Solar System and travel to the stars. If Proxima b is habitable, then it might be an ideal place to move. Perhaps we have just discovered a future home for humanity! But in order to know for sure, we must make many more observations, run many more computer simulations, and, hopefully, send probes to perform the first direct reconnaissance of an exoplanet. The challenges are huge, but Proxima offers a bounty of possibilities that fills me with wonder. Whether habitable or not, Proxima b offers a new glimpse into how planets and life fit into our universe. Thanks to Victoria Meadows, Edward Schwieterman, Giada Arney, and Peter Kelley. Editorial note. This is an outreach article based on the scientific report “The habitability of Proxima b I : Evolutionary scenarios”, http://adsabs.harvard.edu/abs/2016arXiv160806919B , which was submitted to the Journal Astrobiology on Aug 25th. Proxima’s b putative habitability assessments are crucial to interpret the significance of the detection of Proxima b, design follow-up observations and even reshape instruments and space missions. The Pale Red Dot team contacted two expert groups in advance to provide these early habitability assessments at the time of the announcement. Prof. Rory Barnes led one of the teams. The results from the other team (led by I. Ribas + M. Turbat) are summarized at: http://proximacentauri.info and are also technically explained on two research papers. More studies are surely underway. About the author. 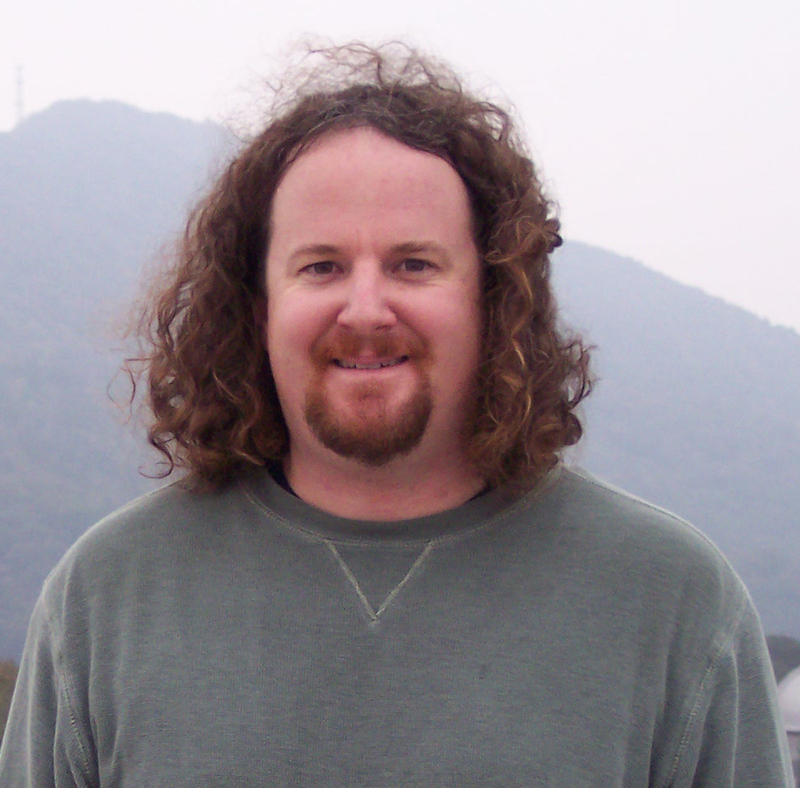 Rory Barnes is a professor of astronomy and astrobiology at the University of Washington in Seattle, USA. He obtained his Ph.D. in astronomy from the University of Washington in 2004. After a post-doctoral position at the Lunar and Planetary Laboratory at the University of Arizona in Tucson, he returned to the University of Washington and NASA’s Virtual Planetary Lab in 2009, joining the UW faculty in 2013. He has studied exoplanets through computer models, initially focusing on the orbital dynamics, but has now broadened his investigations to include the roles of the Milky Way galaxy, stellar evolution, atmospheric effects and the thermal and magnetic evolution of terrestrial planet interiors. Previous PostProxima b is our neighbor… better get used to it!Next PostProxima b, where did it come from? Fingers crossed for a habitable Proxima b! Nazwijmy ją CHIRON na cześć wodza centaurów i nauczyciela Heraklesa, Ajaksa, Achillesa i innych herosów. But, now I’m going to be grumpy. Why, oh why do so many people think like this: “If humanity is to survive beyond the lifetime of our Sun…”??? Seriously? It’s been “only” 500 million years since the Cambrian Explosion. We have been us (in the most generous interpretation) for less than 1% of that. It seems beyond absurd to assume that some sort of extention of our civilisation will exist by the time Sol leaves the Main Sequence let alone that that extention could be regarded as “humanity”. But, if your are firmly convinced we’ll still be around in few billion years how long do you think it will take before “humanity” reaches the capability of a post biological existence? I suspect it won’t take quiiite that long. That is a major concern. But I note that there may be natural oxygen free oases precisely in the locales of a major emergence theory, vent theory. For oxygen mixing ratios of Earth’s deep ocean, vent hydrogen sulfide reacts sufficiently with oxygen to establish anaerobic conditions. [ https://microbewiki.kenyon.edu/index.php/Chemotrophy_Along_Seafloor_Hydrothermal_Vents ] Of course, that is out of the fire into the frying pan so to speak, since sulfite also tend to inactivate metabolic like pathways. [Ibid.] And that is why the alkaline vents of the theory should release smaller amounts of sulfide to be optimal, for Earth. On further cogitation, emergence vents shouldn’t have any specific restrictions on sulfide release, outside of pH concerns. So that may work even better than I initially thought.